Before it gets warm out, I wanted to make a warm, comforting dish using short ribs. It's one of my favorite cuts of beef because it has such a rich flavor, especially after braising for hours. 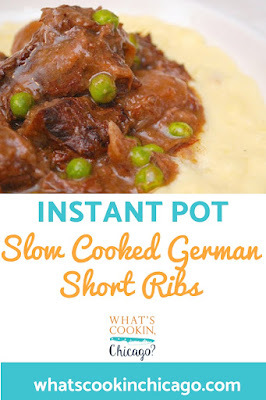 I picked up some boneless short ribs the other day and rather than making the usual wine braised short rib recipe, I wanted something a bit different using my Instant Pot. In a small bowl, combine 2 tablespoons flour, salt, and pepper. Coat the short ribs with the flour mixture. Press SAUTE and add 1 tablespoon oil. When hot, add the floured short ribs and brown on all sides. Add the onions and cook with the beef until softened. In a 2 cup measuring cup, combine wine, brown sugar, vinegar, Worcestershire sauce, mustard, and chili powder. Mix thoroughly. Pour over the short ribs inside the IP. Press MANUAL and adjust the time to 75 minutes on HIGH pressure. Once at pressure, the display will reflect 75 (the number of minutes you initially set) and will begin to countdown to 0 minutes. 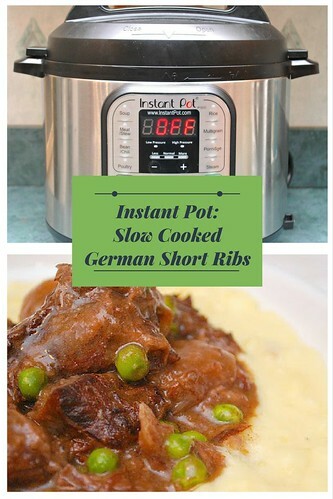 When the IP beeps after pressure cooking for 75 minutes, allow your IP to naturally release pressure for 15-20 minutes. While naturally releasing pressure (also known as NPR or NR), the display will reflect numbers counting up from 1. The numbers indicate how many minutes the IP has stopped cooking since it beeped (or how many minutes it has been naturally releasing pressure). No need to touch your IP while it naturally releases pressure. The pin at the top of your IP will drop when all pressure has been released and it's safe to open. Add the frozen peas to the IP; stir into the sauce. Serve hot.